When it comes to shopping, retailers like Walmart, Best Buy, Target, etc. list all their products online with prices the same as they are in-store. Customers these days know exactly what they want and will easily compare products across multiple such platforms. And when it’s time to make the final call, they invariably go for the one that offers the lowest price. It’s not just the customers who benefit through this price monitoring strategy. Retailers can also gain valuable insights into their competitors and market, and stay one step ahead by making calculated predictions and planning for changes, rather than being forced into reactive decisions. Using Grepsr — either our intuitive point-and-click feature or our concierge service — you’re able to scrape prices (or whatever data points you need, there’s no limit!) 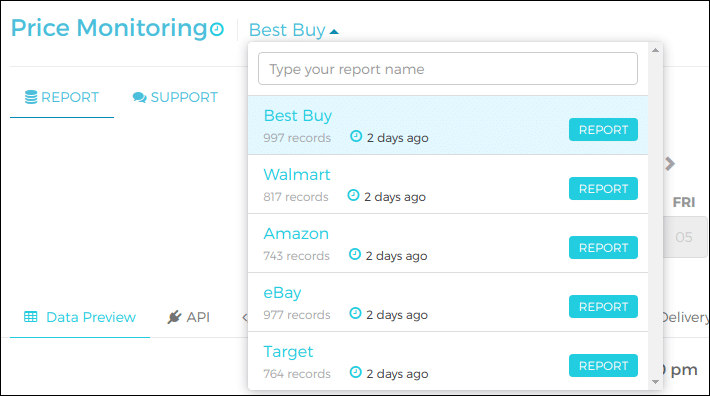 off of retailers, with each retailer’s extracted data stored and viewable as individual reports within a single project. You can also then set up custom crawl schedules for each report so you can automatically monitor all your competitors simultaneously. Grepsr helps you monitor products based on parameters like product names (for movies, TV box sets, …), models (for electronics, appliances, shoes, …), etc. regularly. Upon request, Grepsr will also send you customized reports — on price comparison, price changes, as well as product additions and removals — so you can analyze all this information, historical or current, to drive optimal pricing decisions. While Grepsr delivers these reports on demand, your task is to stay alert at all times. Since prices keep fluctuating, even by the minute in some cases, it’s easy to lose ground on customers, revenue, and most importantly your reputation if you fail to act faster than or at pace with your competitors. Competitor price monitoring may be just one of many strategies to help grow your business, but it’s certainly one of the most effective ones in your arsenal.